Clean your kitchen drain with salt and baking soda for a fresh odor! Learn how to naturally clean a clogged drain in few minutes with this easy recipe. The abrasive and antiseptic properties of salts make it a very useful ingredient inside the household. Salt is essential to human as well as animals, while only 6% of world salt is used in manufacturing food, the other 94% is used in other uses. In the household too, salt has many diverse uses other than just seasoning food. Salt can be used in cleaning snow in the winter to hydrating the body in an intense summer season. We have listed a list of many uses of salt at the end of this article. Back to the point, salt is really helpful in many aspects that are still unknown. One such use is to unclog a clogged drain, be it bathtub drain or kitchen sink drain. Surprisingly, you can unclog a drain easily with the ingredients that you may have already available in your home. The antiseptic and abrasive properties of salt will remove grease, nasty odor and bacteria from the pipes. Mix baking soda and salt in a small bowl and put it on the mouth of the drain. After this step, pour a considerable amount of vinegar on the mixture and leave it for 15 minutes. The abrasive properties of salt and cleaning power of vinegar will unclog the drain with a fresh smell. Meanwhile, put water to boil on high heat. 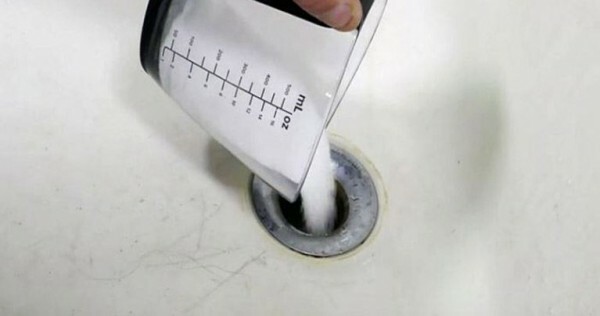 When boiled, pour it down the drain to clean the residual baking soda and salt mixture. This method is sure to work in most difficult clogs. If we add some salt to a flower vase, it will keep the cut flowers fresh for longer. Sprinkling salts at doorways, windowsills to keep ants away from your house. Salt helps treat mosquito bites. Get relieved from a sore throat by mixing salt with warm water. Salt is great for deodorizing stinky sneakers since it has great deodorizing effects. Clean dirty sponges by soaking them overnight in cold saltwater. Remove lipstick stains from glasses by rubbing the mark with salt. Scrub your greasy pans with salt before washing them.